← Simplicity 2599, or I will soon be giving birth to orange ruffles. A self drafted pencil skirt, a fellow sewist in need, and one of my many neurosis. I have never made a pencil skirt before because I thought they were too simple to sew. You know, why sew something that you can buy. I had always had this idea that I would only wear pencil skirts in neutral colors, until I saw this fabric on the clearance table at joanns. It is a home decor fabric that I thought would be terrible for my home but amazing as a pencil skirt. Now after making my first pencil skirt I think I may be addicted. First, it is super easy to draft a pattern to fit your body perfectly. I used this website and it is great, lots of details with the instructions, easy to follow and great results. An interesting thing I learned is that many pencil skirts need 4 darts in the front rather than two depending on your waist to hip ratio. So since my hips are extra big, or my waist is extra small (depending on how I am feeling about looking at myself on any particular day) I need extra darts to get a really good fit. This is great since every store bought pencil skirt I have ever bought has not fit around my natural waist which is what they are supposed to do. In order to fit around my ample hips I have always put up with a bigger waist band therefore having a poor fitting skirt. I am absolutely in love with this fabric. The skirt fits well and is fully lined so feels good when I wear it also. On a side note I made the lining first as my muslin which I have read here and there that some people do and it is a great idea. I didn’t get a really good pic but you get the idea. My only change I would make was to make the godet longer. I made mine 7 inches and I think 9 would have been better. Now onto my neurosis. Now I am not meaning to brag here, but usually when I make something new and unique I get lots of compliments, I am sure any of you out there who sew know what I am talking about because you get the same (see I am not braging if it happens to all of you too). So anyway I wore my cute new outfit to church thinking I was going to get complimented like crazy because I really LOVE this skirt, like one of my favorite things ever love. I got not one compliment. So ya ya ya I should sew for myself and not others, and I should be secure in my own likes and not need other people to feel good about myself, and I really am okay with it. I have had many times where I have made something I liked that no one else did and that is okay, but I thought this one was great. Then I start wondering, “am I crazy, do I really look like a weirdo most of the time” then I get annoyed that I even feel that way. For heaven’s sake I am 34 years old, can’t I have some confidence by now! So I go back and forth with caring then not caring if people like my stuff, does this ever happen to any of you? This entry was posted in bottoms. Bookmark the permalink. 13 Responses to A self drafted pencil skirt, a fellow sewist in need, and one of my many neurosis. I was going to compliment you on it, and now I’ll add that Montana people are crazy! It is amaaaaazing. Joking aside, I LOVE pencil skirts and this is so cute! I would normally not think a strong pattern is great, but I would totally wear this everyday if that were normal. This is why you have a blog, so people can appreciate your genius. As to your inconsiderate church members, well, perhaps they just didn’t notice the skirt since it’s on your bottom half? (I’m trying to be charitable for their unforgivable lapse. 😉 ). Or perhaps it’s so professional-looking it didn’t occur to them that it might be of your own making? I love those flowers and the color… they look like little larkspurs. It’s such a great feeling to have something perfectly fitted to you. Thanks for sharing about the extra darts and the godets–I have a few bought pencil skirts but they never get worn, probably because I feel a bit restricted in the hem. Alas, sometimes those little voices like to rise up every now and then just to pick at your confidence–they mellow out but definitely don’t go away with age. I like to be a bit warrior about it and tell them they are not allowed in my head today! 1. That whole outfit is amazing! 3. As others have suggested – people most often compliment me on clothes I’ve made when it is pretty obvious that I made it. 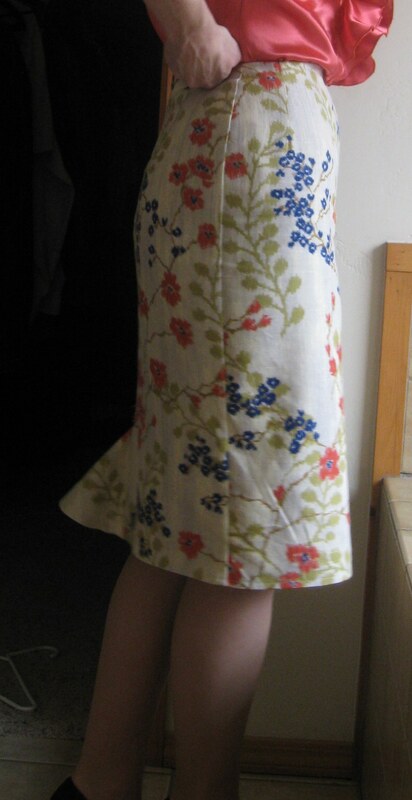 But now that I’m much better at sewing that doesn’t happen as often because my clothes look more RTW. And if I do get a compliment on it and I say I made it they are usually very surprised. Think of it as a compliment that you’re so good at sewing that no one can tell it is homemade! What a great match for your orange top! I like the print too, I would have been drawn to its bright colors. Great outfit! I do get addicted to the compliments sometimes, and then when they don’t come I get paranoid that I look horrible. Oh well! how do you get the hip to be so perfect mine always is too curved and sticks out any tips?